Bournemouth and Poole, as rated by M.I Pro Magazine! JB Amp Repairs is an independent sole trader located within Guitar Mania but not associated with Guitar Mania Ltd or it's employees. Hello and welcome to Guitar Mania ! We are a guitar shop based in Parkstone (an area of Poole) in Dorset in the South of England (UK). This website shows ‘LIVE’ stock levels, barring human error, if it’s showing as “in stock” then it is physically here in stock in the shop ready for you to try / buy / add to basket. No matter whether you come in store or shop with us online we always say with us it’s PERSONAL – personal service, personal attention – that’s the Guitar Mania Experience. Guitar Service and Repair has always been popular here at Guitar Mania especially as 90% of our services are completed within 1 working day. We even offer a priority Emergency Same Day service for a little extra (subject to availability and work load). All at very competitive prices too. Visit us in store for a chat about how we can help. Guitar Mania are based in Poole, Dorset. You can visit us in our shop or here online. 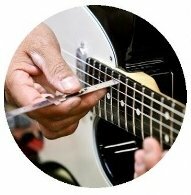 We always say, with us it’s PERSONAL – personal service, personal attention – that’s the Guitar Mania Experience. Taylor 514CE Electro Acoustic Guitar inc Case SALE !